On the morning of Sunday, Nov. 11, the social hall of Temple Beth El was packed for a scrumptious brunch hosted by Jewish Family Service to honor their third cohort of 8ish Over 80ish volunteers. 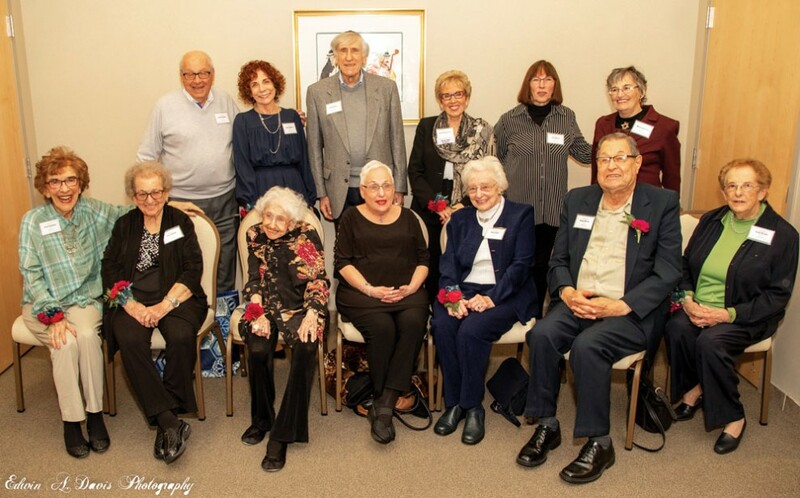 Organizations from across the Jewish community had nominated the 14 selfless older adults (Leonard Abrams, Tama Fogelman, Libby Glass, Sandra Goldfarb, Syman and Anita Hirsch, Doris Lifland, Elaine Rappaport-Bass, Marcia Schechter, Eileen Segal, Fred Sussman, Syril Weinberg, and Norman and Sandy Wruble) for the impact they have by choosing to continue to give back their time and efforts. After guests schmoozed over mimosas, JFS President Rabbi Allen Juda called the program to order. Falling on Veterans Day, the Color Guard from the Louis E. Dieruff High School Air Force Junior ROTC had been invited to join the attendees for the singing of the national anthem. A moment of silence was then observed in honor of Jewish Federation of the Lehigh Valley Executive Director Mark Goldstein z”l, all U.S. veterans and the victims of the shootings in both Thousand Oaks, California, and Pittsburgh. Then, Juda said the hamotzi, and everyone enjoyed an impressive array of breakfast dishes. While dessert was served, the program continued as both Juda and JFS executive director Debbie Zoller gave speeches thanking the audience--especially the honorees--for their support. “Our honorees today have contributed to the Jewish and larger community in many different ways. They are our role models, and we thank them for their example and leadership and for helping give us direction. We feel privileged to be able to honor you; for that, too, we are most thankful,” said Juda. “I am filled with gratitude this morning as I look around the room and see all our incredible honorees and their friends and family who are here to celebrate their dedication to volunteerism and helping others,” said Zoller before also acknowledging the previous 8ish Over 80ish honorees present and all the staff and volunteers who made the event possible. Two such volunteers were the co-chairs of the event, Audrey Nolte and Carah Tenzer, who were introduced by Zoller. “There’s so much love, wisdom and community in this room,” Nolte said as she and Tenzer approached the podium. They made a special acknowledgement of Judy Murman, long-time office manager of JFS, who is planning to retire this year. Then, it was time to present the 8ish Over 80ish honorees. “We are humbled to be in the position to get to know and learn from the 8ish Over 80ish honorees in preparation for this special day. We know that you will share in our admiration and inspiration as you hear their wisdom and words,” said Tenzer before a video montage of interviews with the honorees was shown. After the video, one by one, the honorees were asked to stand and receive a round of applause. The outpouring of gratitude did not end there, however, as immediate past-president of JFS Wendy Born surprised Nolte and Tenzer with an honor of their own, presenting customized plaques to both of them as a thank-you. “More than three years ago, JFS leadership decided to take a giant leap and plan a new fundraiser. ... The biggest challenge was finding energetic, passionate and organized volunteer leaders to take on the roles of co-chairs. We achieved the gold standard in leadership with Audrey and Carah,” said Born.